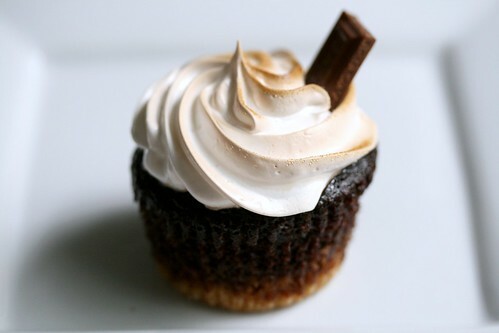 I can’t tell you how long I’ve been waiting to make a s’more cupcake. It was a few years ago I saw a couple of cupcake ladies on some morning talk show making them and since then I’ve been obsessed. I finally decided it was summer, I had to make them! I had a little issue deciding on HOW to make them. I have graham flour that I bought to make my 8 month old homemade graham crackers so I thought I could make a graham cupcake and then somehow do chocolate and marshmallow. But ultimately I decided on a graham cracker crust under a chocolate cake with a marshmallow seven minute frosting. Mmmmm. I found that my shot glass worked perfected to press down the graham cracker crust! About the only thing I remember from watching those ladies make the cupcakes on TV was that they added chocolate to the top of the graham cracker crust. I don’t remember WHY. But heck, it’s chocolate so it can’t do anything but make the cupcake better, right? I’ve made a seven minute, or boiled frosting before. But I wanted something with actual marshmallow in it. Thanks to google and fluff I found the fluff seven minute frosting. I’ll be honest it admit it doesn’t taste any different than a regular, non marshmallow seven minute frosting. 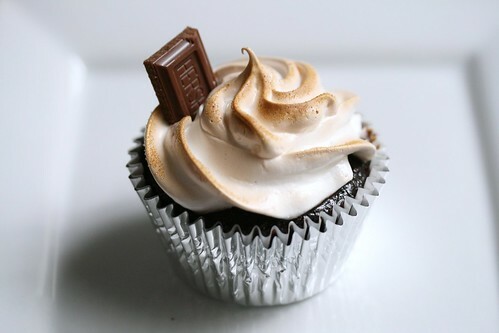 But this is a s’more cupcake so it made it feel better there was marshmallow somewhere in the cupcake! I don’t have a blow torch or a dessert torch. I thought about buying one but the cheapest it about $20 and I have a kitchen about the size of a postage stamp so I decided, with the advise of my Mom, to just use the broiler in my oven. It worked really well!! You do have to keep an eye on them because they go from not toasted looking to OMG THEY’RE ABOUT TO BURN in about one second. Also? Have your Mom do it like I did! Thanks Mom! These cupcakes are my new favorite. The chocolate on top of the crust just adds a very pleasant chocolate punch to the cupcake. And the graham cracker crust and chocolate chocolate cake is just about a match made in heaven. Add in the delicious seven minute frosting, which has always been one of my favorites, and this is cupcake utopia. It really truly tastes like a s’more. Only better. Because it’s a cupcake. In a small bowl, combine the graham cracker crumbs, sugar and melted butter. Mix well with a fork. 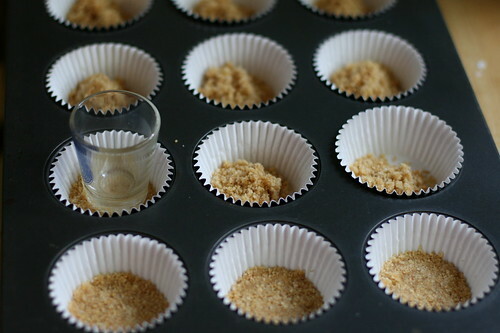 Put about 1 tablespoon of the graham cracker mixture in the bottom of each cupcake liner and press down to line the bottom. 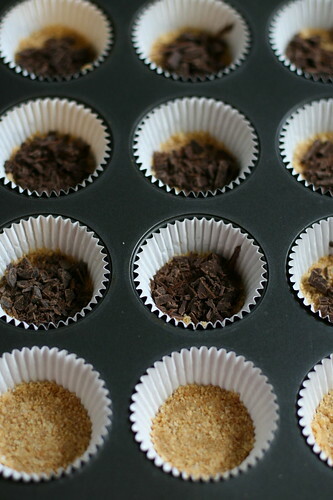 Sprinkle a small amount of the chopped chocolate on top of the graham cracker crusts. Bake at 350 for 5-7 minutes. Remove from the oven. Combined dry ingredients in large bowl. Add eggs, milk, oil and vanilla; beat on medium speed 2 minutes. Stir in boiling water (batter will be thin). Pour batter on top of the graham cracker crust until cup is 3/4 full. Bake at 350 15-20 minutes or until done. In double-boiler top over hot, not boiling water, combine all ingredients except vanilla. With hand mixer, beat until soft peaks form. Remove from heat and continue beating until stiff. Beat in vanilla. Frosting cupcakes. If you want them to look toasted either use a dessert torch or use your oven’s broiler. I really want to get back into baking and updating this blog and I thought what better way than doing a series of summer cupcakes these last few weeks before summer comes to an end. 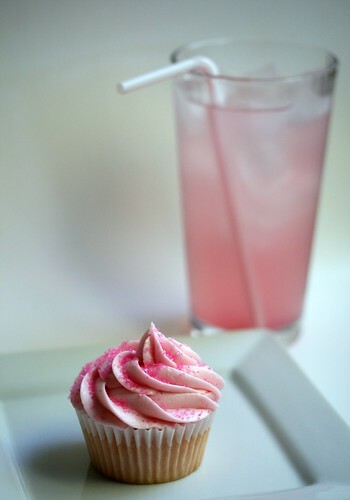 I decided the first cupcake that needed to be made was a pink lemonade cupcake. I was googling around for a recipe and having a hard time finding one that didn’t call for a boxed cake. I tweeted just that and Jenna from All About Avacakes was nice enough to find a recipe for me! Then strangely enough while looking through one of my many cupcake books I found that EXACT cupcake! It was from my 125 Best Cupcake Recipes cookbook though and the last time I made a cupcake from them they ended up in the trash. But because someone else had made them and approved I decided I was okay! I wanted to get a candy straw type thing for a garnish but couldn’t find anything. I bought some black licorice “string” but it was too floppy. 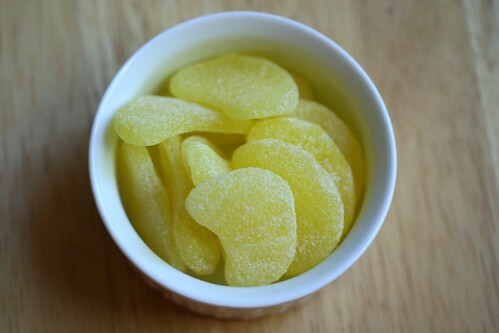 I also purchased some lemon “slices” from my grocery store’s bulk candy department but because they were yellow I didn’t really like how they looked with the pink cupcakes. I finally settled on just some pink sprinkles. These cupcakes do definitely taste like pink lemonade! A bit of summer in cupcake form! Preheat oven to 350 F. Line muffin pan with liners. In a small bowl, combine flour, baking powder, baking soda and salt. Set aside. In a large bowl, whisk together sugar, oil, egg whites and lemonade concentrate. Alternately whisk in flour mixture and buttermilk, making three additions of flour mixture and two of buttermilk, beating until just smooth. Add just enough food coloring to turn the batter a light shade of pink. Scoop batter into liners (fill about three-fourths full). 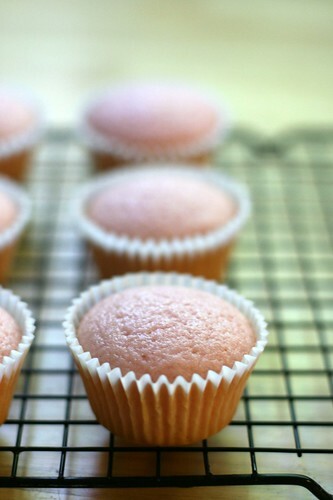 Bake in preheated oven for 20-25 minutes or until tops of cupcakes spring back when lightly touched. Let cool in pan on rack for 10 minutes. Remove from pan and let cool completely on rack. Add the butter, confectioner’s sugar, salt, lemon juice, and a few drops of food coloring to the stand mixer and mix on low using the paddle attachment until combined. Turn the speed to med-high until the buttercream is fluffy and uniformly pink. Pipe or spread onto cooled cupcakes.